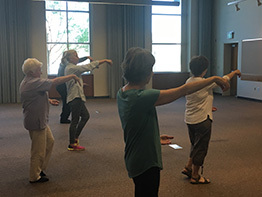 Simplified Tai Chi is offered every for free every Tuesday from 10:00 – 11:30 a.m. in the Medford Library Large Meeting Room. This special eight-step Tai Chi form has been researched and designed specifically for better balance and ease of movement and is especially beneficial for folks over 50 or those with physical issues like arthritis or fibromyalgia. The sessions are led by certified instructor, Holly Hertel.